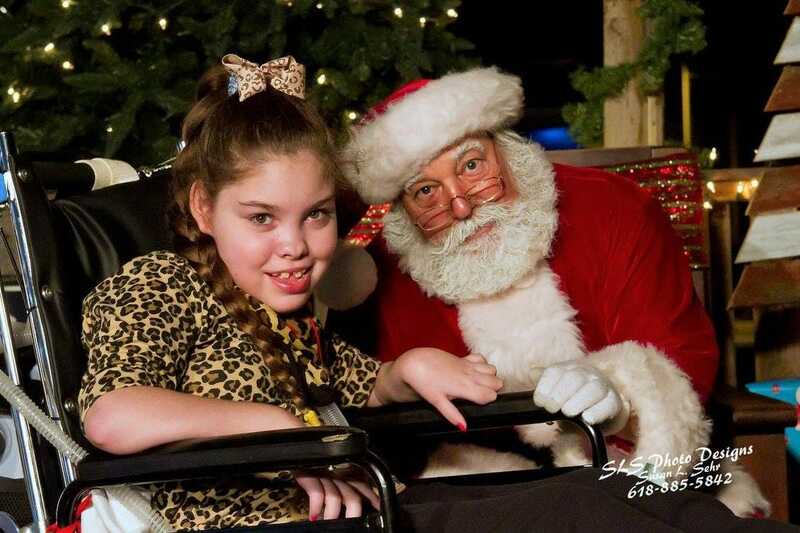 In the Fall of 2015 it was brought to the attention of the Board of the JCBA, through the good nature of a local charity, Isaac's Ray of Hope, that there was a young lady in Jersey County who really enjoyed the sights and sounds of The Polar Express. The request from Ms. Drainer, Tess's Mother, was to see if there was a way to show the film in a public way and make it a fantastical experience for all who participated. The board then took the helm, with the direction and guidance of some of the JCBA staff and volunteers the Downtown Country Christmas was established. A Free Family Event devoted to the children and families of the community to come out and see what we had to offer as a business community. That first year was a total success boasting free photos with Santa to all who could make it through the line, local cuisine from many of the local restaurants, free kids games sponsored by the Jerseyville Public Library, a bake sale supported by many of the generous business members of the JCBA, a free matinee showing of The Polar Express at the Stadium Theater open to the public, a living Nativity By Bethel Baptist Church, and Live Entertainment. Our community had found a new tradition to look forward to during the holiday season. There was only one thing left to be done... make it grow! After countless hours and planning by a committee of 14 the 2nd Annual Downtown Country Christmas came into reality. It kept most of the fantastic aspects from the year before and simply grew into a full street festival. 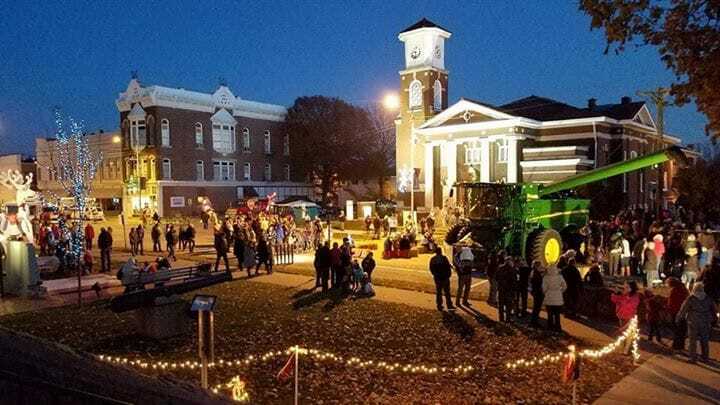 The City of Jerseyville Christmas Tree was relocated to the festival grounds, allowing for a Community Tree lighting. Santa Arrived in style on a Helicopter thanks to the assistance of Survival Flight and the Jerseyville Fire Department. Vendors lined the middle of Washington St. showcasing all there was to offer in Jersey County from big business to Mom and Pop, as well as handing out something free to any child or family that came by. The establishment of "The Kringle" award, was a welcome addition to the festivities giving recognition to a wonderful young man who made it his life mission to make a difference in the fight against childhood cancer. Our first recipient was his mother Kimberly Wade and the Kid's Shouldn't have Cancer Foundation - In Memory of Johnny Wade. Chosen by members of the DCC Committee she and future recipients will decide on the next recipient, choosing from people nominated by the residents of Jersey County. 27,000 Lights brought the Downtown area to life with interactive displays and plenty of opportunity for a family photo. 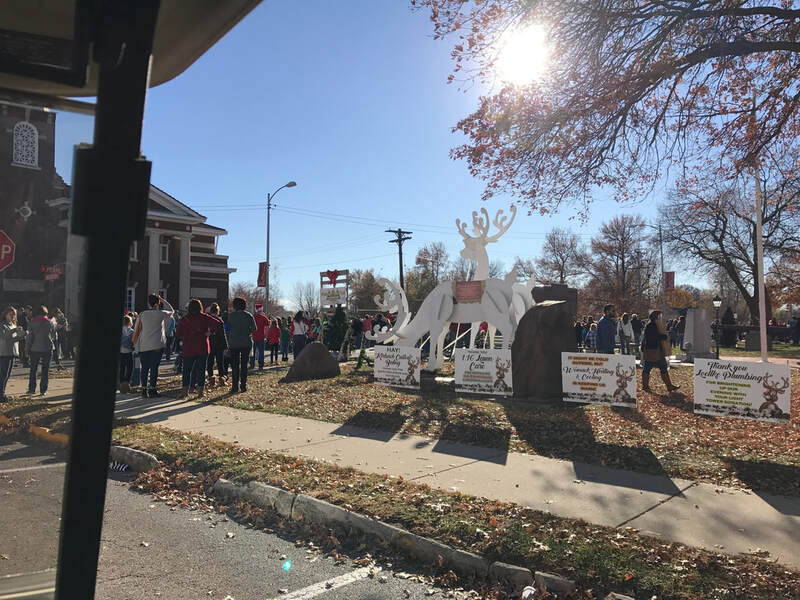 The Downtown Country Christmas Festival is a community celebration welcoming our neighbors from near and far to join us in the sights and sounds of the Holidays in Historic Jerseyville, Jersey County, Illinois. Planning for the 2017 Festival began in February. The Festival was about to take a direction that we the Board and Volunteers are very proud of. On March 31st, 2017 the Downtown Country Christmas Festival, Inc. received its Articles of Incorporation and officially applied and were awarded their standing of a 501 c(3) Non-profit later that summer. This was a huge year for the festival for growth. Planning continued over the course of the next nine months. Some of the highlights would be permission received by the State of Illinois to Close Hwy 67 for the festival. Addition of 4 more planters by the City of Jerseyville bringing our planter tree campaign with the businesses up to 12 possible trees for the Downtown Area. We also added a 6000 sq ft Exhibition tent to hold up to 43 vendors from across the region. 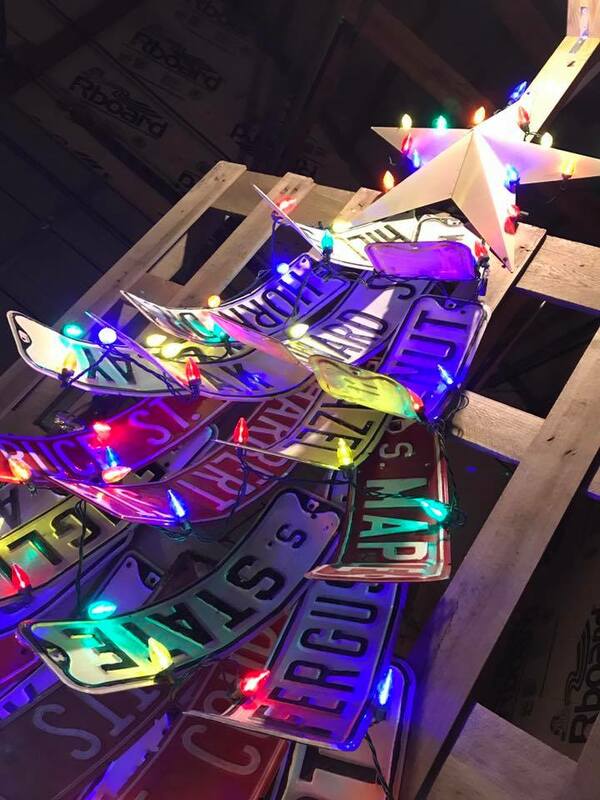 This was in addition to a partnership with JCCYM a local youth group having a craft show in neighboring Holy Ghost School, the two combined brought over 100 vendors and crafters to Jerseyville for the perfect shopping weekend. 2 Stages for plenty of entertainment options and thanks to the Tri-county Antique Club we were able to bring back the hay rides that had to be canceled the year before. The Festival began bright and early on the 25th at 8:30am. Families were encouraged to skip the dishes and give the kids a morning to remember with Breakfast with Santa at the Knights of Columbus Hall. At noon, the Jerseyville Stadium Theater had a FREE showing of The Polar Express for the Kids. At 2:00pm Santa arrived by helicopter, and the Festival began. State Street and the surrounding roads were closed, and music began on two separate stages at opposite ends of the Festival. Tours began at the Cheney Mansion, accessible from the festival grounds by a free shuttle to the Cheney Mansion and additional parking at the high school. And the magic really begins for our most special Festival visitors – the kids! Elf School Classes was in full swing, Ms. Claus’s Bake Shop began selling cookies, and the North Pole Post Office opened to the public. At 2.15pm Elf’s Boulevard opened with over 18 different FREE kids games and activities. 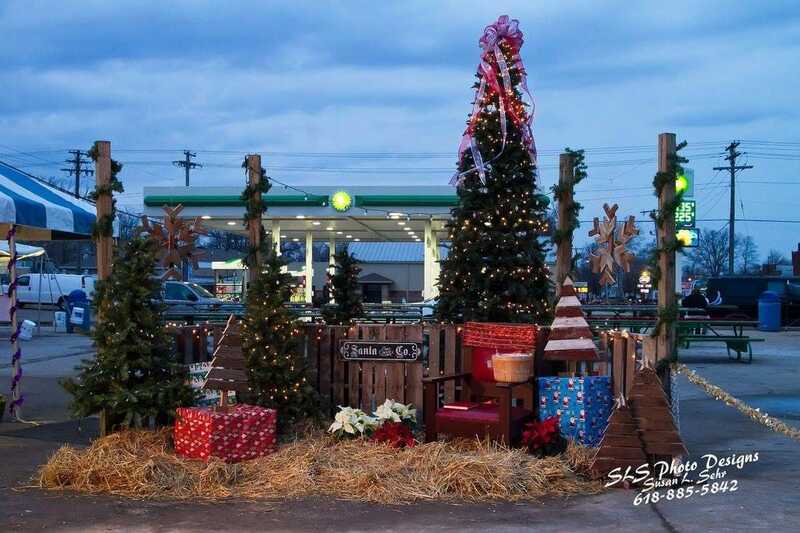 You could get your photo taken with Santa or take a holiday hay ride. The 35ft Christmas Tree was lit at 5:00pm, and the winners of the Light up your Business Award (Sweet Life Salon and Spa) and the Kringle Award (Janice Arnold - Angel Ministries) were announced. 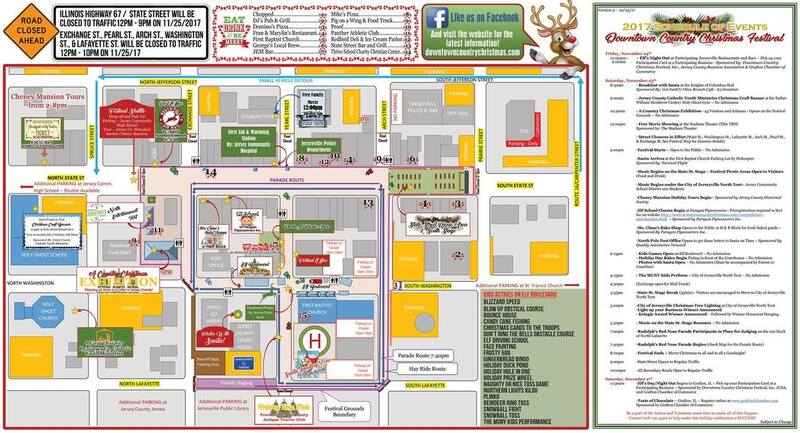 Rudolph’s Red Nose Parade began at 7:40 with 12 entries from the local business community to a very impressive crowd. The day was a success and now on to 2018.